Earlier this month, the New York Times reported that the Obama administration had increased funding for the Civil Rights Division, encouraged stricter enforcement of anti-discrimination laws and removed the Bush-era practices of putting important decisions in the hands of political appointees rather than career lawyers. According to a 2008 Inspector General’s report as well as former and current employees of the Voting Rights Section, political appointees regularly ignored recommendations from career attorneys when they didn’t suit the Bush administration’s political agenda. Traditionally, the agenda of the Voting Rights Section had been protecting the right to vote. Under Bush, critics contend, that agenda became ensuring that only the right people could vote. For eight years, the political appointees and some of their new, ideologically approved hires in the Voting Rights Section fostered what former career lawyers called an atmosphere of fear and retaliation, where the goal was to help the GOP win elections, not to protect the franchise. Ironically, those “great traditions” began under the auspices of a Republican administration. President Dwight D. Eisenhower created the Civil Rights Division under the Civil Rights Act of 1957, specifically to help ensure blacks would be able to vote. Politicized hiring had affected all levels of the Justice Department, but no where was the politicization or hostility more evident than in the Voting Rights Section, critics charge. Under former section chief John Tanner, the part of the Justice Department charged with protecting the franchise for all Americans became a partisan operation. When Bush’s political appointees were staffing the Voting Rights Section, according to the report, they wanted to avoid hiring "lefties" or "big libs" whom he saw as "adherents to Mao's little red book." The report charges that Tanner, then-head of the Civil Rights Division Bradley Schlozman and Counsel to the Assistant Attorney General for Civil Rights Hans von Spakovsky made hiring decisions on a “consensus basis.” Schlozman in particular was allegedly looking for "ideological comrades" and "real Americans" who wouldn't be "opposed to his agenda." The IG report described Tanner’s frustration with previous administration’s hiring practices—namely that getting hired in the Civil Rights Division back in the day meant having to be a “civil rights person.” Imagine that. As reported by WJLA-TV in 2007, Schlozman, Tanner and von Spakovsky had created a racialized climate so hostile it had driven almost all of the black lawyers out of the Civil Rights Division—along with a number of other career civil rights lawyers. Instead of protecting the right to vote, critics say, the Bush administration focused on bogus “voter fraud” cases—sometimes against voter registration groups like ACORN—that were meant to be a pretext for stricter voting laws that would depress the turnout of likely Democratic voters, namely, minorities. While the Republicans pushed for voting laws and practices that disenfranchised minorities, they had a compliant political staff running the Voting Rights Section in Washington that looked the other way, according to former Justice Department officials. As a result of politicization in the department, during the 2008 election, the Voting Rights Section often fell short in its commitment to protect voting rights, forcing independent voting rights groups to step into the breach. “There have been numerous complaints to the Justice Department over the last several years involving intimidation and suppression directed against minority voters,” says Kristen Clarke, a former employee in the Voting Rights Section, now working at the NAACP Legal Defense Fund. “Those complaints have gone unaddressed.” Clarke said the Voting Rights Section has brought two voter intimidation cases—both on behalf of white voters, one of them being the infamous case involving the New Black Panther Party, which was recently dismissed and is now the subject of an internal investigation. Even though Tanner has left the Civil Rights Division, and according to current employees in the Justice Department interviewed by The Root, taken with him the climate of “vindictiveness” that defined his tenure, other Bush-era hires remain. These hires were handpicked by political appointees looking for partisans instead of civil rights lawyers, critics charge. Because Holder has reinstated protections for career attorneys so that their jobs aren’t subject to political whim, they’ll be hard to cut loose. “Having seven, six and half years of politicization in the hiring and personnel decisions will take a real toll on any institution,” said Joe Rich, a former chief of the Voting Rights Section. Despite that, Rich said, there remains a "nucleaus" of dedicated attorneys and analysts in the division. “I always laugh when I see the criticism from conservatives, saying now that the career people are taking over they’ll get a lot of liberal and left-leaning people,” says Hebert. “That’s how conservatives look at the enforcement of civil rights, as a liberal agenda, instead of a law enforcement agenda.” The last thing many Republicans want, Hebert says, is for the Voting Rights Section to do its job. During Holder’s tenure, hope has welled up in the formerly distraught Voting Rights Section, according to current employees at Justice. 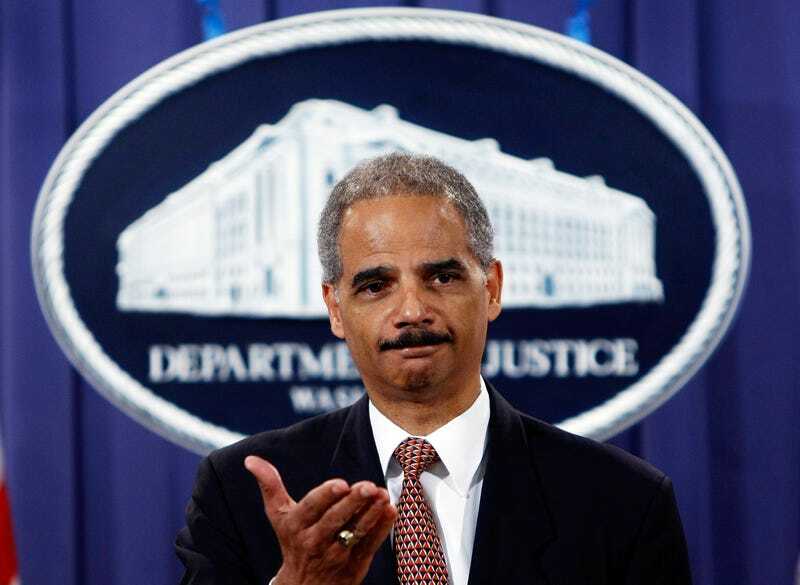 Earlier this year, at a celebration for Holder’s confirmation, one of the attorneys from the section approached the attorney general and identified herself. Holder looked her in the eye and put his hands on her shoulders. “Help is on the way,” he said. And not a moment too soon. Adam Serwer is a writing fellow at the American Prospect and a regular contributor to The Root.